Are there days when you feel like retreating into a cozy, protective cocoon of your own making? And if you had the option, wouldn’t you encrust yourself in bits of gold, pearls, and precious stones? If so, you might have more in common with a caddisfly than you realize. 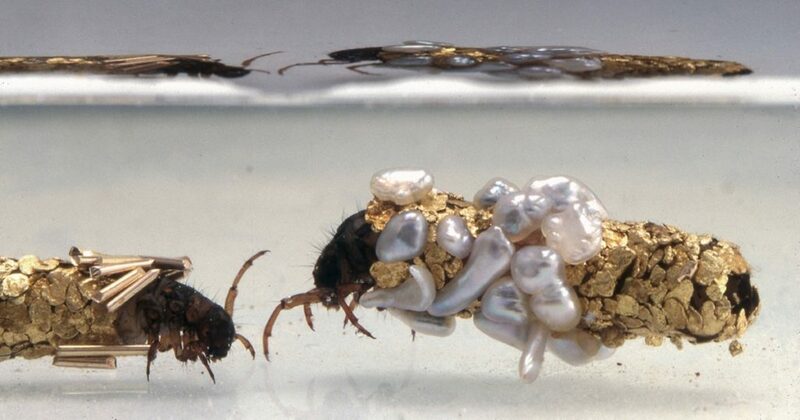 ABOVE: French Artist Hubert Duprat’s unique partnership with caddisfly larvae resulted in amazing gold-adorned cocoon-like cases. Credit: Hubert Duprat. This file is licensed under the Creative Commons Attribution-Share Alike 3.0 Unported license. Unless you’re a fly fishing enthusiast, you might not know the peculiarities of the caddisfly lifecycle. The larvae are aquatic, living in streams and lakes until metamorphosing into winged adults. To protect themselves underwater as they feed and grow, the larvae spin silken cases, which they reinforce with items from their environment. It’s not uncommon to find larvae cases made of bits of rock, sand, twigs, bark, leaves, seeds, and even fish bones and snail shells. 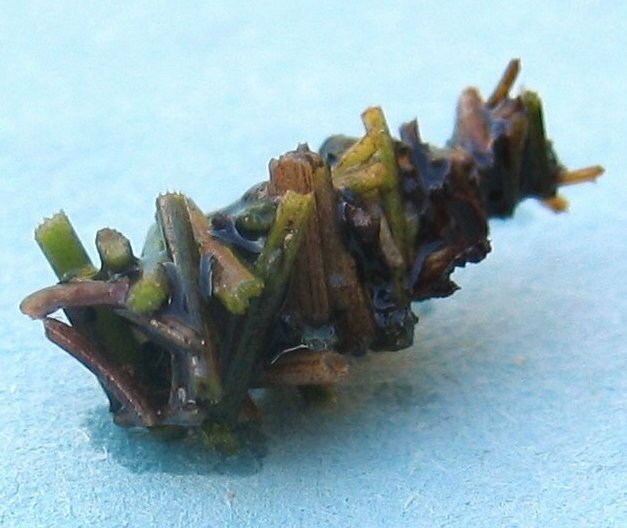 A caddisfly larva created this protective case using plant matter bonded together with silk. Credit: Kristian Peters. This file is licensed under the Creative Commons Attribution-Share Alike 3.0 Unported license. This creature’s resourceful spirit and engineering prowess captured the imagination of French artist Hubert Duprat. What would happen, he wondered, if he provided the larvae with a controlled set of building materials? In the 1980s and ’90s, he brought this artistic experiment to life in his exhibit, Trichoptère. He collected the larvae, removed their natural cases, and placed them in climate-controlled aquariums of pure treasure. The larvae had at their disposal golden flakes, pearls, turquoise, opal, and other precious stones. 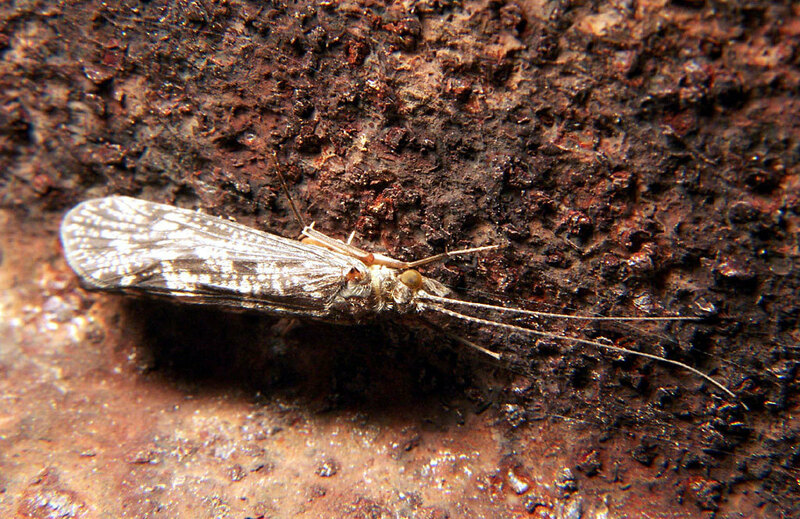 The adult caddisfly. Credit: Bruce Marlin. This file is licensed under the Creative Commons Attribution-Share Alike 2.5 Generic license. If you find the insect world as fascinating as I do, you’ll be interested to know that rather than building their body shield as a one-time project, a larva will repair and enlarge its case as it grows. Conveniently, the case serves to deter predators while also providing traction on the riverbeds. Once ready to transform, the larva anchors itself in place and seals the ends of the tube. At long last, it will chew through the tube and use it to float to the surface, where it will fly away as an adult caddisfly. If you’re not such a fan of creepy crawlies, just let your mind wander back to the gentler image of the delicate golden cocoons offering protection and luxury at the same time. Learn more about Hubert Duprat’s work at ThisIsCollossal.com. 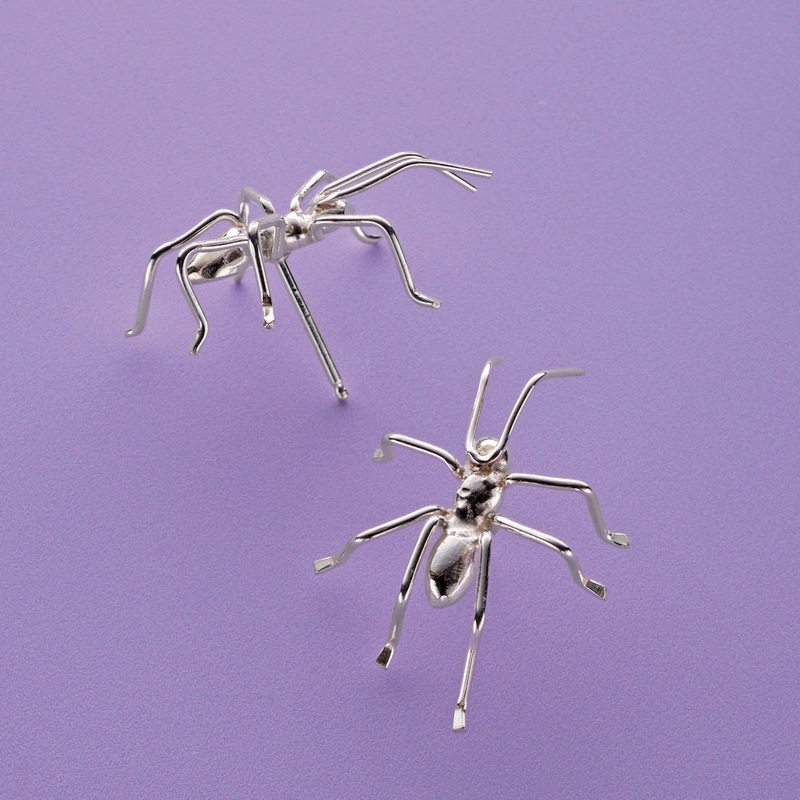 In the March 2016 issue of Lapidary Journal Jewelry Artist, Betsy Lehndorff shares her adorably leggy soldered ant earrings. With their bright colors and reflective surfaces, insects provide plenty of inspiration for jewelry. Jeff Fulkerson’s stamped cuff definitely feels reminiscent of some kind of multi-legged creature. Spiders, climbing ants, dragonflies, butterflies, and caterpillars also encourage us to incorporate the intriguing shapes and fantastic patterns of nature. Did you know there’s even a beadweaving stitch inspired by caddisfly larvae? You can learn more about the appropriately-named caddis weave and even make a bracelet in Experiment with Caddis Weave. 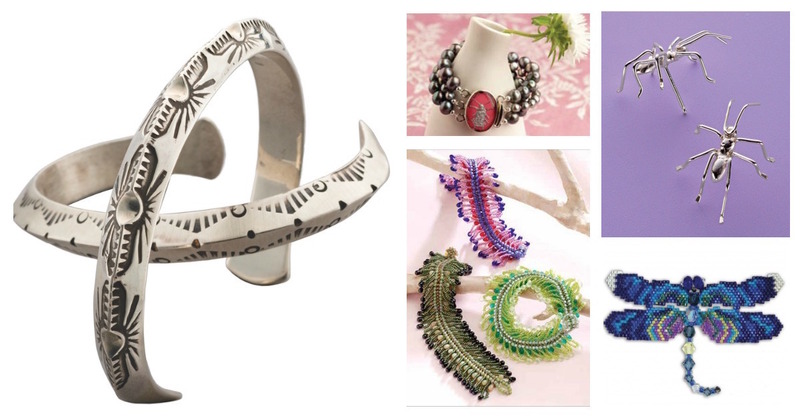 Clockwise from left: Jeff Fulkerson’s stamped metal cuff, Royal Arachnid Bracelet project download, Betsy Lehndorff’s Climbing What Earrings Project Download, a dragonfly from the eBook Brick-Stitching Nature, and Catch Me A Caterpillar pattern download. Whether you construct a gold-flecked mosaic like the caddisfly larva or simply incorporate the colors and patterns of butterfly wings into your work, I’m sure you’ll find some reason to appreciate the insect world. Intrigued by Insects? 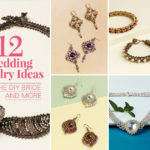 Check Out These Inspirational Products!